Our online reseller, Kagi, offers convenient online ordering and download 24 hours a day, every day. The new iLock 3 is designed as an extension to Mozilla Firefox 2 or 3. iLock adds and removes the functionality you need to use Firefox in a locked down kiosk environment. Firefox is a very secure browser, developed by the Mozilla Foundation. 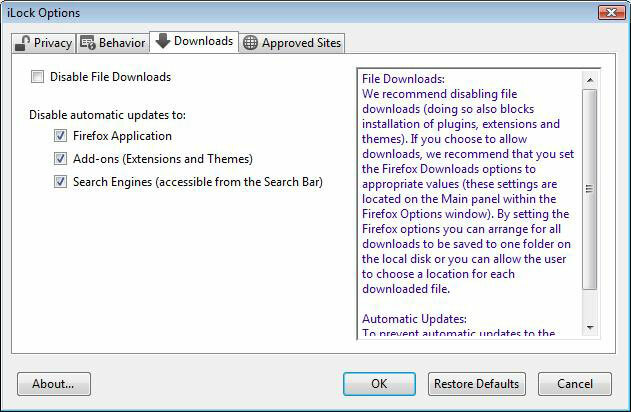 Firefox is a free download available at http://www.mozilla.com. Secure Desktop 7 plus Firefox 2/3 or Internet Explorer 6, 7, or 8 is simply the best way to create a browser-based desktop system for factory automation, retail point-of-sale, hospitality kiosks, libraries, museums, schools, labs, and cafes. Anywhere a browser-based desktop is needed, Secure Desktop 7 provides the right solution. 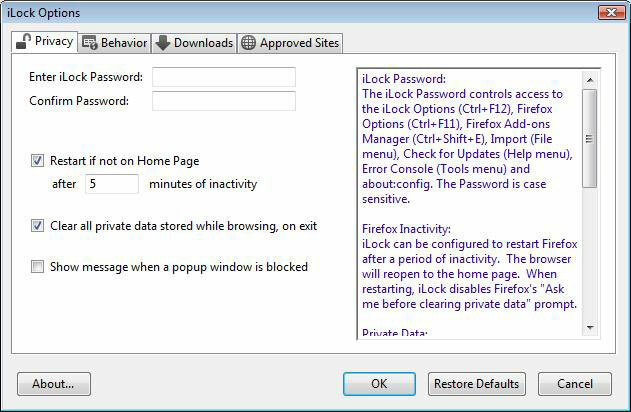 iLock provides a case sensitive password for the Firefox Options (Ctrl+F11), about:config, Firefox Extension Manager (Ctrl+Shift+E) and the iLock Options (Ctrl+F12). New keyboard shortcuts were added for each dialog. When the iLock Firefox extension is enabled, all private data that is stored while browsing is automatically deleted when the browser is exited. The private data can also be deleted after a period of inactivity, while re-initializing the browser state to the home page. Private Data includes Browsing History, Saved Form Data, Saved Passwords, Download History, Cookies, and the Cache. iLock adds two modes to control the Firefox menus and toolbars: Full screen and a regular window. When Full Screen mode is enabled, Firefox starts Full Screen, just like if the View | Full Screen menu option were selected (F11). The min/max/close buttons are removed and the F11 keyboard shortcut is disabled. The regular window mode removes the File, Edit, View,... menubar. Toolbars, the right mouse context menu, and keyboard shortcuts that are not related to web browsing are disabled with either mode. iLock considers the following keyboard shortcuts non-browsing shortcuts and will remove them: Control N, T, O, W, S, P, B, H, U, D, M, J and F11; Control Shift D and Delete; F1. 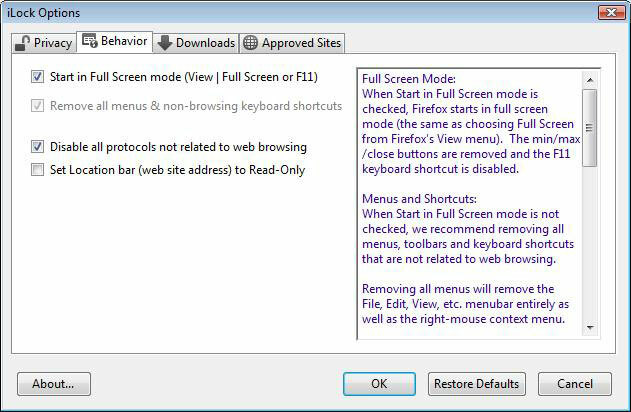 More detailed control over individual menus and keyboard shortcuts are available through the about:config page provided by Firefox. Any URL starting with about: or file: is disabled regardless of this setting. Sometimes, you may want to use Firefox for essentially one web site (the home page). If this is the case, you can choose to not display the location bar (URL) or set it to read-only. You can still view it, but no longer manually type into it. We recommend disabling file downloads and automatic updates. 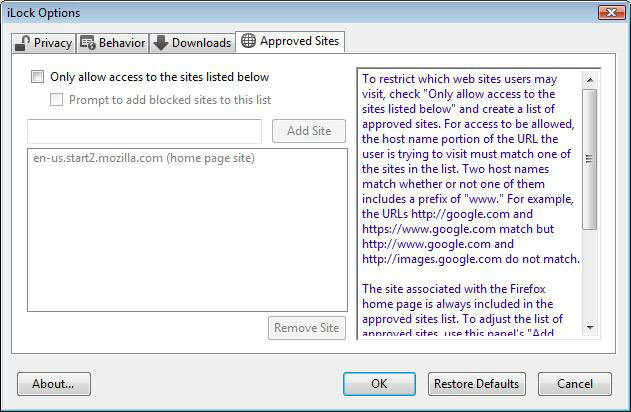 Using the Approved Sites feature, you can build a white list of approved web sites using a learning mode. Handcrafted Endpoint Security Software | © 1994-2015 Visual Automation, Inc. All Rights Reserved.